NEW – GDPR There is important information for friends’ groups about the General Data Protection Regulation – see below under: DATA PROTECTION. 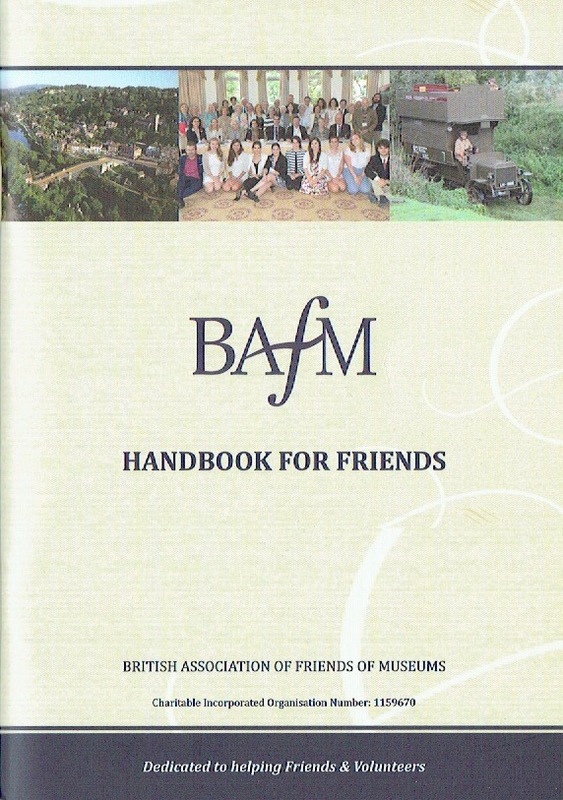 Copies of the BAFM Friends Handbook are available to all at no cost. 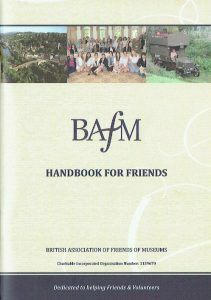 The handbook is available from the BAFM Administrator (see below). Copies of the BAFM Volunteer Managers’ and Administrators’ Handbook are now available in two different formats: hardback (£10), or as a CD (£5). Prices include postage. This is available from the BAFM Administrator (see below); please enclose payment made payable to ‘BAFM’. BAFM has a pro bono arrangement with a top London charity law firm. They can offer brief advice on relevant legal matters that a member group has been unable to resolve locally. If the matter requires more detailed advice than can be provided within the terms of the pro bono agreement they will quote a charity rate fee. In some cases it may be that adequate legal opinion could be obtained from a law firm in the member’s area. Some museums may already have a legal firm associated with their Board that can help but in a situation where there is a conflict of interest a separate opinion may be necessary. In every case the enquiry must be placed with the BAFM Administrator (see below). The Association for Independent Museums (AIM) also offers a series of “Success Guides” that are free to download on a range of important topics including fundraising, the visitor experience, recruiting volunteers, museum cafes, retailing, international work, venue hire, governance, business planning, social media, risk management. However, much of the content of these are aimed at museums’ operation, and members may need to be selective about using sections of relevance to their work. Click here: AIM Success Guides. The Charity Commission produces a guide (Publication CC 29 – ‘Conflicts of interest: a guide for charity trustees’). It can be downloaded free from their website. www.gov.uk/government/organisations/charity-commission See the Charity Commission section for contact details in Scotland and Northern Ireland. On 25th May 2018 stricter rules apply on how organisations handle personal data – through the General Data Protection Regulation, or GDPR. It is important to all Friends’ groups, as it seeks to control the collection, use and storage of ‘personal information’. Thus if you have members of your groups, it is most likely that you will be handling personal information’. Please do not ignore this. The best advice from BAFM is to go to the ‘Information Commissioner’s Office’ (ICO) website – www.ico.org.uk On the first page you have options – go for the yellow one (‘For Organisations’). You can choose to go direct to the ‘GDPR’ area or the ‘Small Organisations’ one. It is most likely that you will need the latter. In this part there is a lot of advice to explain GDPR & what your organisation should do. Do the activities of the individuals/companies you have dealings with conflict with your charitable aims? Are you at risk of alienating your supporters or beneficiaries by dealing with such individuals/companies? It is acknowledged that most museums will have a museum’s policy regarding ethics, however the friends’ group needs to consider whether this covers all aspects of their activities. These are particularly relevant where a Friends’ group supports a museum that is specialist. Members of the Friends’ groups who come in contact with young or vulnerable people may have to be put through the Disclosure and Barring Service (DSB) checking process organised by the museum. Formerly the Criminal Records Bureau (CRB), this ensures that individuals that work with young or vulnerable people are adequately screened.